This discount coupon will give you a $3 off for each general admission every time you visit. This offer is valid until June 27, 2019. 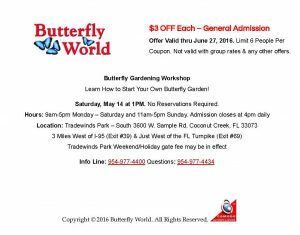 Just print this coupon and bring it when you come visit Butterfly World. Either click the image or the link below for a printable version of the coupon. Click here for printable version!